Dottie happily patrols the chicken pasture after spending the winter indoors. Next year we hope to house her in a greenhouse. 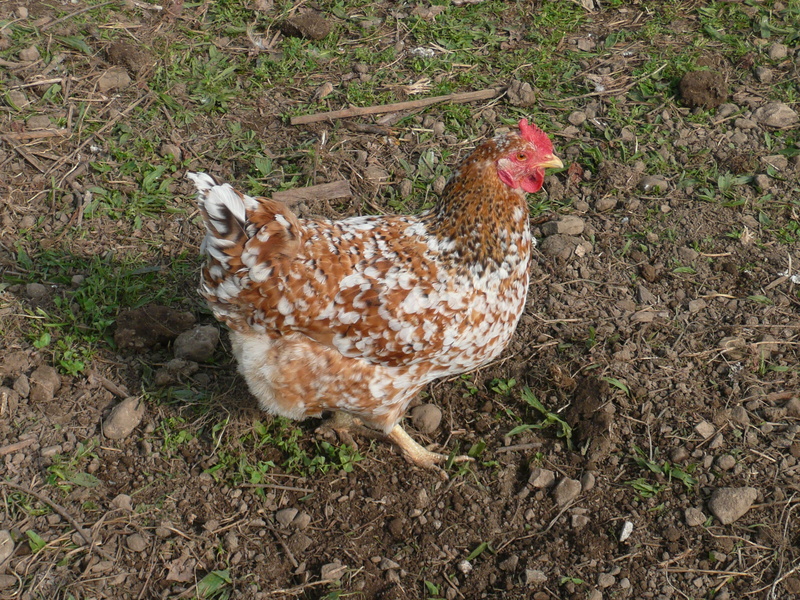 The ancestors of our polka-dot hen, Dottie, came from the Basque region of Spain. It may seem odd that a southern chicken could feel at home as far north as Great Lake Huron’s Bruce Peninsula, but the two areas share some things in common. One is the almost identical seasonal light and day length: both coastal areas share the same 45-degrees-north latitude as sun-spots like Monaco, Bordeaux, and Tuscany. But in midwinter, there’s no way Dottie could mistake her current home for her ancestors’ on the coast of Spain, or for her more distant ancestors’ home in South-East Asia. For our chicken’s winter comfort, we want to capture the daylight of southern Europe while insulating them from the frigid winds and temperatures of frozen Lake Huron. It’s not too hard to do–we housed them in our light-filled garage last winter, and plan to introduce them to shelter in a greenhouse next winter. But even poultry from South-East Asia can’t take the summer heat trapped in a greenhouse for long. Which leaves us with a nice problem to have: after evicting Dottie and her friends, what plants can we grow in an environment hotter than a balmy Bruce Peninsula summer? 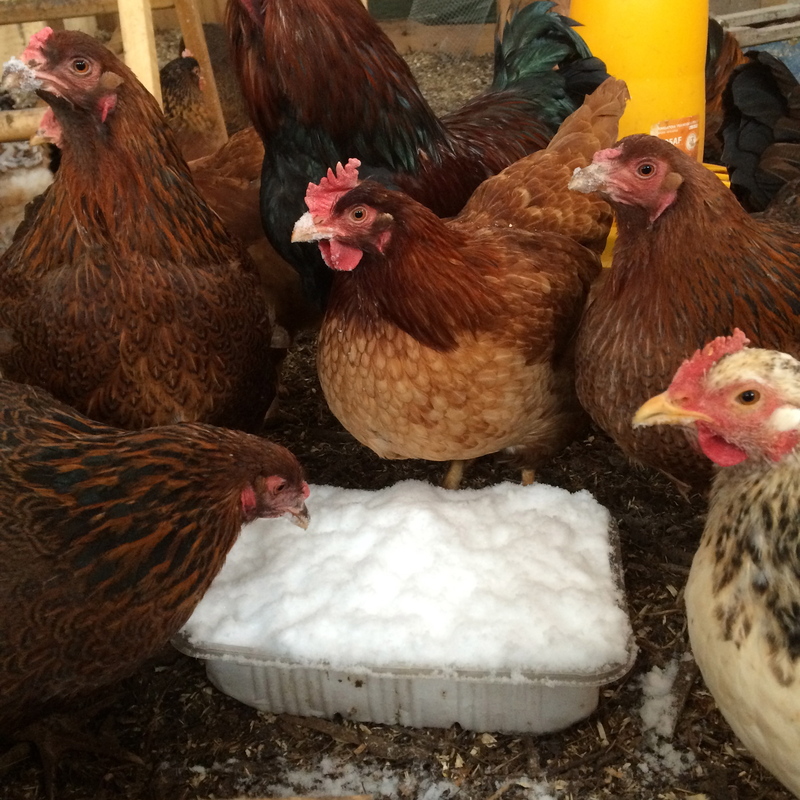 Chickens in the garage during the winter, dining on snow. Kinda looking guilty. If we’re going to go south, let’s go a lot further south. How about to Mexico and Peru, two countries that bracket the tropics at the equator? We could grow their peppers and tomatoes. We like fruits and veggies like those and could sell some of them to help pay for the greenhouse/barn. But an “ordinary” greenhouse barn isn’t enough for us. We want one that we can move around, yet still anchor to the earth so it doesn’t imitate a huge, expensive kite. 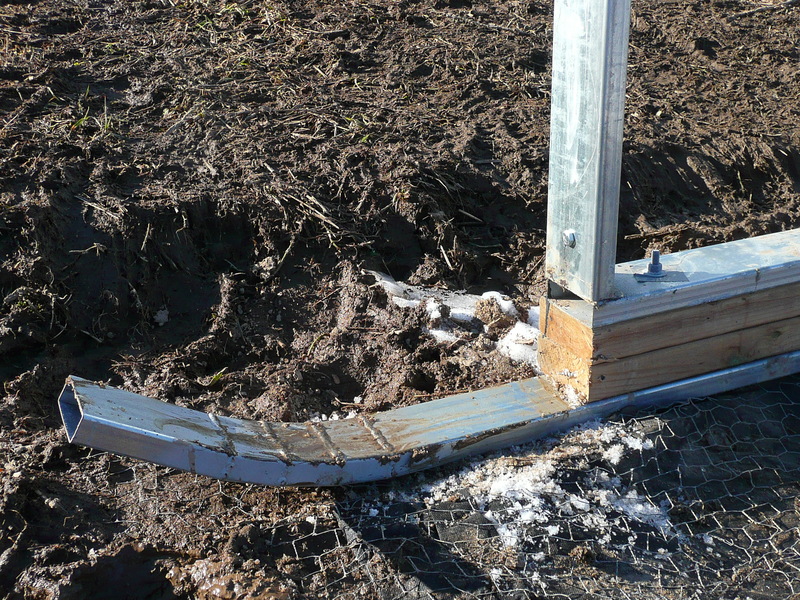 Many greenhouses or hoop houses are linked to the earth with spiral ground anchors or big beefy metal stakes. This is a challenge at our site: the current depth of soil over bedrock ranges from 2 to 6 inches. What to do when you are surrounded by such boundless constraints? Get creative. An article in Forbes magazine (July 12, 2013) details how constraints drive genius. How did all-world architect Frank Gehry dream up his iconic billowing steel museum in Bilbao, the capital of Dottie’s Basque homeland? According to creativity experts including Gehry himself, it took constraints. Our greenhouse will not be a work of genius, but the amount of constraints leave a lot of room for creativity to sprout up. Stay tuned for the harvest. 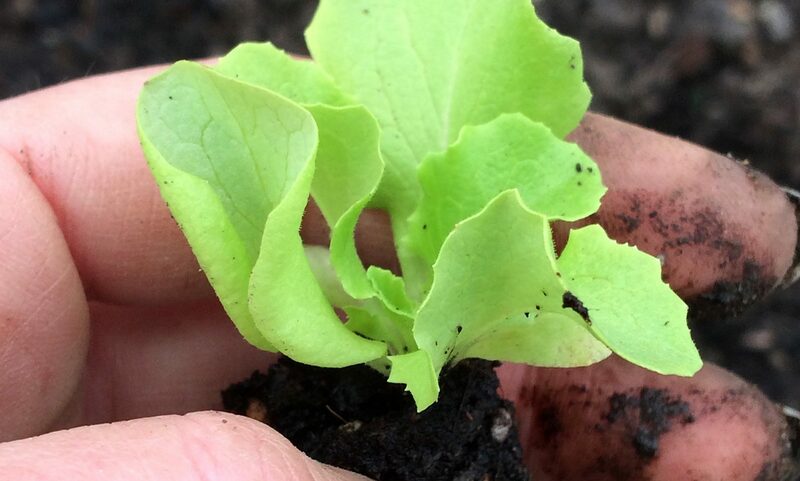 Where did you get your hoop house kit? It looks pretty amazing!